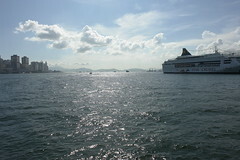 As you can see from this photo, Hong Kong does and can have clear sky days. Unfortunately, these days are far and few between in recent years. Coincidentally for some strange reasons the situation got worst ever since the handover (in 1997) of Hong Kong back to China. In the past week when Hong Kong's temperatures reached the mid 30°C, the conditions became worst, to the point of dangerous for many people who suffer from respiratory diseases. The Hong Kong Observatory explains that the hot temperatures resulted in conditions where there are not enough wind to blow the pollutants out to sea and away from Hong Kong. This caused a high pollutant count at street level and low visibility in the Victoria Harbour. The Environment Minister further explains that these excessive pollutants are the direct result of increased power consumption by Hong Kong residences. Which caused the power companies to increase their electricity productions. The Energy Minister's report is also when I first realize that Hong Kong still relies heavily on coal fuel for electricity generation. According to government's figures, as of the end of 2005, coal fueled energy constitute 55% of the fuel source for electricity generation in Hong Kong, while the cleaner and safer natural gas fuel constituting only 18%. How come Hong Kong, a modern metropolis still uses coal for majority of its electricity generation? Is it due to economics or business decision. In an attempt to lower power consumption, the government began a major advertising and educational campaign to encourage Hong Kong residences and businesses to raise the thermostat so to reduce general energy consumption in the territory. Unfortunately, for those who lives in or visiting Hong Kong, will be familiar with the experience of walking along a street lined with retail shops, and feeling gusts of cool (sometime cold) air conditioned air pumping out from these shops (normally without doors). Even on the hottest of days, one will often get enough relieve from these shops to make walking along the busy and crowded streets bearable. Remember I am talking about out in the open, so there are excessive use of energy in Hong Kong. Both electric companies in Hong Kong also have natural gas fueled power plants. One of the power company even erected a large wind mill for experimental power generation on a near by island within the Hong Kong territories. This latter form of power generation is not the most practical in Hong Kong, mainly due to the lack of land in Hong Kong for such purpose. With wind power being one of the most viable natural source of energy, and Hong Kong's spirit of exploiting the coastal waters, the government is therefore considering a plan to build a farm of wind mills in the Hong Kong territorial waters for energy generation. I have an idea that will kill-two-birds-with-one-stone, per se. We can build a farm of thermal and solar powered wind mills in the territorial waters of Hong Kong. At initial thought you may think this idea sounds a bit weird and contradictory. Please allow me to explain. My idea is to utilize thermal and solar energy to spin these wind mills (giant fans) in the farm, and this farm or farms will also be positioned strategically. 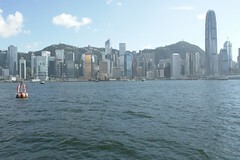 As a result they generate enough turbulence in Victoria harbour and the general Hong Kong coastal regions to blow the pollutant into the sea or at least disburse it enough to help its natural dissipation. These thermal and solar powered wind mills will also be able to generate electricity, which it can either transport back to the land power lines or store for days when the thermal and solar energy are not enough to run the wind mill farms. You can see how this idea can solve a few problems with a simple self contained solution. 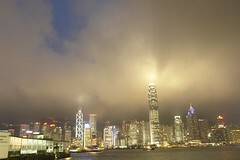 So until the right people acknowledge my idea, let's all do our part and return the Hong Kong skyscape that we're all used to in the past decades. Newer:Jane Szeto on PowerBook 15"Older:How Young Will They Be?